Have you ever wondered what was in the stars for you? Neopian stars are unique and tell stories all on their own, so we teamed up with the Altadorian Astronomy Club to give you in the depth on all twelve star signs, also known as the zodiac. Each of these signs are divided by elements (fire, earth, air, and water), and then further examined by star coordinates and readings. In this article, you can determine your own sign by matching your birthdate to the date ranges for each sign, and read about what the stars have in store for you, and also learn a little bit about all the signs! First, we shall start with the fire signs. These signs are, as one might expect, fiery, intense, and even sometimes temperamental. Fire is life-giving, but it can also cause harm. Fire burns with fuel, and as easily it can burn out, it can also grow with slight sparks. Fire signs are powerful but this intensity must be managed properly. Neopians who fall under the Ixi star sign are often extroverted, competitive, and natural-born leaders. Ixi will always be at the forefront of a good discussion or chat. They can be guild founders, taking the initiative to start and build communities from scratch, and also run recurring chat boards. Ixi like to be number one, so you might see them on the game leaderboards and excelling at any and all plots. Lastly, Ixi are blunt, and won’t hold back when telling you their opinions, but that’s only because they think honesty is important. So, if an Ixi tells you your customization doesn’t look quite right, they aren’t trying to be rude, just honest. If you are born under these dates, you are a Kougra star sign. Neopians with this star sign are bold, smart, and brave, willing to do what is needed to get a job done. This can translate into being strong participants in the War of the Obelisk and other Battledome events. Kougras are affable and have no problem making friends, so they might be the ones entering a NeoBoard and immediately be greeted by everyone. Kougras don’t believe in modesty, and will not hesitate to congratulate themselves on a victory instead of waiting for compliments. Born near the end of the year, Unis are best known for trotting off the beaten path. They are known for following their own interests and won’t follow everyone else. Unis might avoid being in organized guilds and won’t pick the most popular Altador Cup team just for popularity reasons. They love traveling and exploring, so they’ll adventure to all the Neopian lands in pursuit of seeing everything Neopia has to offer. Unis are creative and imaginative, so they might write stories for the Neopian Times and participate in Storytelling. Next, we will look into the earth signs. As the name might suggest, earth signs are more grounded and realistic. They keep a steady foundation, which breeds stability and loyalty. This can translate to being practical, but some might be focused too much on the materialistic and surface level of things. Down to earth, Kaus are seen as the anchor of the Neopian zodiac. They are honest to a fault because they don’t want drama in their lives. You’ll never see a Kau arguing on the Neoboards! 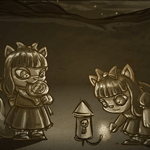 They are ambitious, so they will set high goals when training their pets or saving for an item. However, Kaus are also stubborn, so even if the goal seems unattainable, they might stick to it anyway. But expect them to get it in the end, as they’re willing to work hard. Lastly, Kaus are fiercely loyal, so their Neofriend circles now will be their Neofriends forever. The Xweetok zodiac sign is seen as the most graceful, sophisticated, and generous. When there is a Neopian in need, like during Charity Corner, expect Xweetoks to be first on the scene. Xweetoks concern themselves with what they wear and how they decorate their Neohomes, as it is what others see. Because of this, they will always have their Neopets customized and dressed to perfection, often winning Notable Neopet spotlight, and might even be chosen for the Notable Neohome spotlight as well. The date ranges for Peophins are between the end of the year and the beginning of the year, a beautiful cycle! Peophins are known for being detail-oriented and hardworking. These Neopians are the ones who find solutions for difficult avatars and plot steps. They are better at following rules than going out of their own, so they might not do well in creative sectors like the Random Contest. However, they are good at making Neopoints, mainly in safe things like restocking or investing in stocks. We shall look into air signs next. Air is to wind, which symbolizes constant movement, new ideas, and actions. As with every sign, air can blow both ways, into some Neopians who are airheaded or those who are so powerful, they are a storm. Nevertheless, like the wind, they are always impossible to catch. If you weren’t aware before, this is the only sign has two symbols, Flotsam and Jetsam, the twins. If your birthday falls under the Flotsam & Jetsam, you are probably a kind presence around your Neofriends, and they appreciate your affection. They also know that there is no other that is as loyal as you, as fierce loyalty is one of your top traits. If you are of the Flotsam & Jetsam sign you value intelligence, and can be found yourself at the Faerieland library doing the daily crossword. Flotsam & Jetsam also want their Neopets to read as many books as possible, so they go for the Neopian Book Award or Booktastic Book trophies. The sign of the Krawk is artistic as well as diplomatic. Being an artistic sign that also values beauty, Krawks will excel at things such as the Beauty Contest or being accepted into the Art Gallery. Those who fall under the Krawk zodiac sign will also be at their happiest place when there is harmony and balance in their lives, and they will go out of their way to make sure the harmony is long term. Krawks love being surrounded by their Neopets and Neofriends and their loved ones appreciate the fact that Krawks put others before themselves and look out for the happiness of who they care about. The Lutari is a tricky sign, because they can be quiet and shy one day, but the next day they’ll be noisy and full of energy, the life of the party. In general, though, they will need alone time between seeing Neofriends and being active. Lutaris love to help others, so you might see their names at the Kadoatery very often, or doing quests around Neopia. Neofriends of Lutaris will often find themselves going to them for advice on any arguments. This zodiac sign is very logical and level-headed, so they rarely buy extravagant items they don’t need or make trades they will later regret. Lastly, we have the water signs. Water is best known for being fluid, and that’s just how these Neopians are. They are sensitive, intuitive, and are able to thrive in all situations. Treat them poorly and they can become icy, treat them well and they will be life-giving. Water signs, like water itself, need security, or else they will disappear. The Bori is a passionate sign, but can also be overly emotional. The Bori has a tough shell, but it only hides how sensitive they really are. If a friend is in need, the Bori will be there for them every step of the way. Bori are intuitive and have a knack for what the future might hold, so they might try their luck at the Neopian Lottery or Food Club betting. They will put their all into something they believe in, even if the outcome is negative. Neopians who are the Bori star sign will keep a close, tight circle of friends, as don’t necessarily enjoy a large crowd of people at once, so they will socialize in private, small guilds instead of the public Neoboards. Neopians who fall under the Buzz star sign are independent and unafraid. If you find yourself in an argument with a Buzz, good luck — their opinion will never be changed. Buzz is an authentic sign, they are honest and don’t like when others aren’t. Neopoint-wise, they are likely to want to buy big-ticket items even if cheaper items can do the job just as well. But they are also funny, so Buzz might be inclined to create comics for the Neopian Times or enter into the Caption Competition and take home the gold! But just don’t get on their bad side, they have a prickly outer and will have no qualms about ignoring you. The Koi is a gentle and understanding sign. Neofriends of a Koi star sign find that being around them is comforting, and the Koi usually tends to have a wide variety of friends. Koi are compassionate and emotional, so they are not overly concerned with making Neopoints and living an extravagant life. Koi are happier with the little things in life, experiences over the materialistic. 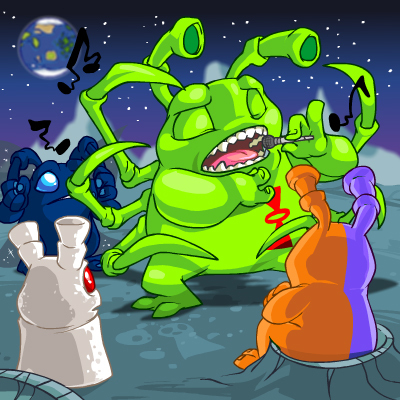 Koi are inclined to enjoy music, so they can be found browsing the Neopian Music Shop or jamming out at the Tyrannian Concert Hall to their favorite bands. Koi also enjoy water – especially swimming and fishing and whose favorite Neopian lands are Maraqua and Mystery Island. Brought to you by Neopian astrologers Kellian (k3l26) and Maile (sunshine482), along with help from the Altadorian Astronomy Club, we hope this article has given you wonderful insight into the Neopian zodiac. Does your sign describe you accurately?